Is Warner Bros. Developing a Blue Beetle and Booster Gold Movie? Will a Blue Beetle and Booster Gold movie finally arrive? The Tracking Board brings word that Warner Bros. and DC Entertainment are set to add another DC Comics property to their extensive roster of planned films with a big screen team up of fan-favorites, Booster Gold and Blue Beetle. The outlet reports that superstar executive producer Greg Berlanti (“Arrow,” “The Flash,” and “Supergirl”) will direct the Blue Beetle and Booster Gold movie, which is being pitched as a “superhero buddy cop movie” with an emphasis on comedy. In addition, Heroic Hollywood reports that writer Zak Penn, the write of X-Men: The Last Stand, The Incredible Hulk, and a the initial draft of The Avengers, is rumored to be writing the script. Check back here for confirmation on these reports as we learn them. Blue Beetle, however, is a legacy hero with three different men taking on the mantle. The two most notable heroes to use the name, Ted Kord and Jaime Reyes, were both partners with Booster Gold at different points in time. 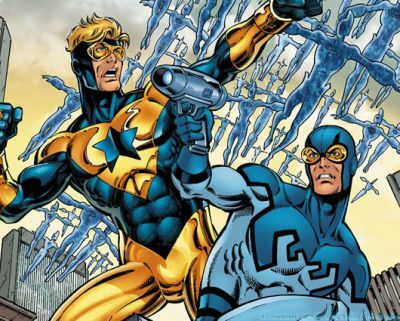 Would you like to see a Blue Beetle and Booster Gold movie? Sound off in the comments below!